Whether we are coaching you as you manage your assets, or whether we are managing assets for you, if your investment account is mature, we follow this general approach — appropriately tweaked to your specific process preferences and needs. A mature account is one for which expected new money additions are minimal compared to the size of the accumulated assets — where replacement of lost assets is not a practical or feasible option. The approach also works well for non-mature accounts, but the “matching” issues may not be currently a necessary management issue. Your investment portfolio is not only about pursuit of returns; it is also about risk management. Matching investment assets with capital expenditure needs, and matching investment cash flows with needed spending from investments are among the most important aspects of portfolio risk management. 1. Maturity matching: You should seek a portfolio that has maturities and ready liquidity at predictable values at predictable times to fund your portfolio dependent expected capital expenditures (capital budget). 2. Cash flow matching: You should seek a portfolio that will provide sufficient cash flow to fund your expected spending (cash flow budget). If your investment cash flow cannot be sufficient to fund your spending, then the difference should be treated as an annual capital item handled by maturity matching under the capital budget. 3. Risk Limits: All the while, you need to be assured that you are being adequately compensated by cash flows and expected capital gains for the volatility and permanent capital loss risks you assume. 4. Asset Allocation: Your asset class selection and class target weights should be consistent with your capital budget, your cash flow budget, and your risk limits. 5. Process Management: The asset classes, target allocations and the securities selected to represent each class should be managed by a process that maintains the appropriate relationships between the capital budget, cash flow budget and risk limits (collectively, the management parameters). You have certain known or potential capital expenditure goals and obligations that can be estimated as to amount and timing. If you have significantly more assets than required to meet your ultimate goals and obligations, you may be able to assume high levels of risk with all of your assets to pursue gains. 1. Obligations due within 1 year should be funded with money market assets. 2. Obligations due from 1 to 10 years should be funded with bonds in the same amounts as the obligations, and with average durations that match, or at least approximate, the timing of those obligations. 3. Obligations due in more than 10 years may be funded with fixed income assets or with assets with greater potential for capital appreciation, such as common stocks or certain other non-fixed income assets. To the extent possible, the asset classes and the securities within the classes should be selected and weighted to provide investment income that at least matches the non-capital spending budget. 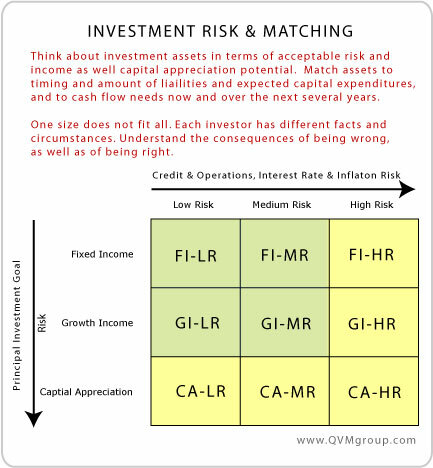 While capital spending is handled by matching with asset maturities, operational spending should be dealt with through investment income to the extent reasonably possible and consistent with risk limits. Operational spending that cannot be covered by investment cash flow should be projected and treated as a scheduled capital expense with matching asset maturities. A balance between growth potential and loss potential is essential. The more mature the asset pool (the less ability to replace assets with future earnings) the more the balance should lean toward conservation and sustainability — reducing loss potential at the expense of growth potential. The less mature the asset pool (the more the ability to replace assets with future earnings), the more the balance should lean toward potential growth with the associated assumption of more risk. The classes in the portfolio should, to the extent possible, have low correlation of returns. About 90% or more of portfolio return is generated by asset class selection and weights. Only about 10% or less of long-term return is generated by security selection. Therefore, time and effort is most effectively used concentrating on asset classes. Asset classes should be considered in terms of long-term and short-term history, current market conditions, and expectations for future markets that will not be precisely like past markets. Substantial discussion of how and why classes may perform differently in the future is essential. To prevent a single class from overwhelming the portfolio returns, the maximum weight should be 25% per class. The overall asset allocation plan should include a set of allocation policy target weights (target weights) for each class. A collar of minimum and maximum weights should accompany the target weights. That provides some short-term flexibility around long-term allocations. Each sub-category should be given a minimum and maximum weight within the class. 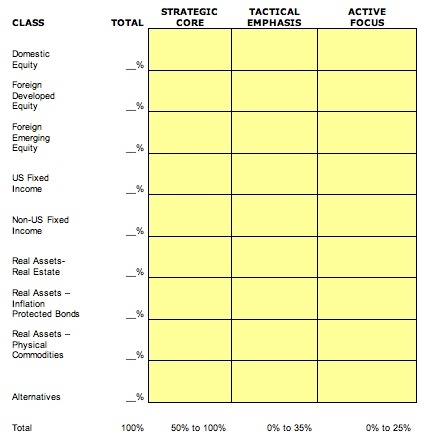 The result is a two-dimensional matrix of asset classes and asset class sub-categories. Specific securities are selected to represent each sub-category of each asset class. The Strategic Core should generally be populated with broad, diversified no-load, low expense funds, or ETFs. Tactical Emphasis is generally populated with narrower no-load funds, ETFs or ETNs that increase the exposure to selected sectors, industries, regions or countries that are included in the broad funds of the Strategic Core. Active Focus, if not left empty, is generally populated with specialty no-load funds or individual stocks or bonds. See our prior article on Basic Suitability Issues in Portfolio Design for additional thoughts on appropriate portfolio risk based on “economic age” and financial condition. A simple benchmark portfolio should be selected against which to measure the management of the actual portfolio. See our article on practical return measurement issues in portfolios with interim deposits and withdrawals. Benchmarks don't have “ins” and “outs”, but real world portfolios do. The benchmark could be as simple as a two class model with US stocks and US bonds (i.e. 60% US stocks and 40% US bonds), or as complex as a single broad index fund for each asset class at the target weight for the class. See our weekly updated short-term performance tables for 11 different simple two class (US stocks / US bonds) benchmarks. Long-term performance of different US Stock / US Bond allocations from Vanguard are also provided there. Portfolio design and continuing review should be done in terms of the management parameters (maturity matching, cash flow matching, risk limits, asset classes, target weights and security selection). Tactical deviation from the allocation target weight within the minimum and maximum range for a class may be considered if supported by clear logic about the relationship between classes or changes in future expectations for the class. Periodic rebalancing (and optional rebalancing triggered by threshold deviations form assigned weights) should be performed to satisfy the management parameters. Rebalancing can be pursued more aggressively in a tax-free or tax deferred account due to no wash sale tax consequences of buying and selling securities. See our article on the need for a tax-loss harvesting security substitution list for taxable accounts. See our article on wash sale prohibitions with respect to IRAs and related party accounts . Asset class target weights, minimum weights, and maximum weights should be considered for change no more than annually, but preferably not more often than at 3-year intervals. Security selection for the Strategic Core holdings should be reviewed at such time as superior alternatives are available, but not more frequently than annually. Security selection for the Tactical Emphasis holdings should be reviewed annually. Security selection for the Active Focus holdings should be reviewed quarterly, or earlier on an event driven basis, if necessary. Advisor and client should confer at least quarterly to review the portfolio — more often if events dictate, or if client prefers more communication. Among other things, they should consider overall performance versus the benchmark, the performance of specific securities within the portfolio, current and expected market conditions, rebalancing, tax loss harvesting and security substitution, and any other possible needed adjustments or redesign. Whether you call on us to assist you, or you use other advisors, or you manage your own assets, we recommend you adopt an approach similar to the one we have just described.